Construction is one of the largest and most people-intensive industrial sectors. In many countries, however, construction is also one of the most highly criticized in terms of its employment practices and industrial relations. People and culture are too often seen as variables that must be manipulated in the cause of improved productivity. 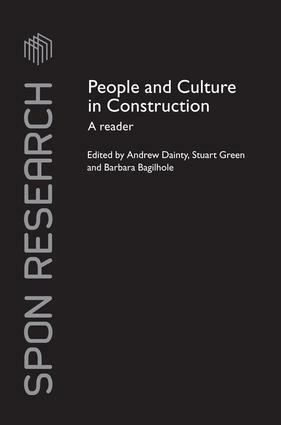 This important new work provides an essential corrective to the current literature by focusing on people and culture rather than sector efficiency. It presents the latest thinking from a diversity of perspectives derived from a major ESRC seminar series and invited contributions from leading researchers. Its interdisciplinary approach draws together industry and research and is international in its relevance. investigates how to address the skills shortfall currently affecting the industry's performance. Andrew Dainty is a Senior Lecturer in Construction Management at Loughborough University’s Department of Civil and Building Engineering. He is an internationally renowned researcher in the field of human resource management in the construction industry. He is co-author of HRM in Construction Projects (2003), and Communication in Construction (2006), also published by Taylor and Francis. Stuart Green is Professor of Construction Management in the School of Construction Management and Engineering at the University of Reading where he is also Director of the Innovative Construction Research Centre (ICRC). He has published widely in a range of international journals and has extensive experience of large multi-institutional, multi-disciplinary research projects. Barbara Bagilhole is Professor of Equal Opportunities and Social Policy and Associate Dean Research in the Faculty of Social Sciences and Humanities at Loughborough University. She has taught, researched and published extensively in the field of Equal Opportunities and Diversity legislation and policies. Her last book was Women in non-traditional occupations: Challenging Men (Palgrave Macmillan, 2002).